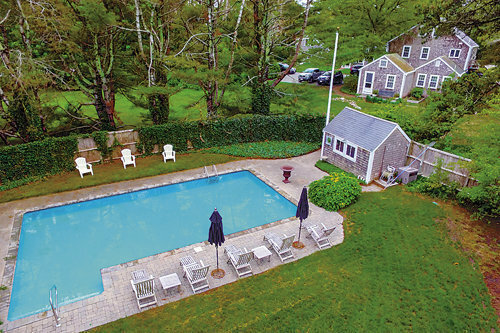 Single Family Residence, Cape - Brewster, MA Perfect location for mixing business with pleasure. A beautifully renovated antique, with professional grade kitchen, wide board floors, loads of bedrooms, a separate, legal apartment, all zoned commercial on 1.9 acres, in a residential area. Complex is centrally located for easy access to Cape Cod Bay beaches, the rail Trail (cape Cod bike path), and other town attractions. Loads of parking space available. Ideal as a rambling family residence with room for relatives. Or use the compound for a B&B, art gallery, office complex, restaurant or other business activity. The apartment, with private driveway, three bedrooms and one bath, could serve as owners quarters. The property also boasts a heated in ground pool, pool house and a large field. Well screened by tall hedge from the road.